It was grade 5, I was really nervous. Overweight, insecure, and about 30 seconds from passing out, the teacher yells “ George, whenever you’re ready.” As the words vibrated through my ears, I stared at the audience before me; their thoughts, their words, and their non-verbal cues echoed a wave of ridicule that shattered the little motivation I had left. Yet, I proceeded. That day marked the worst presentation I ever gave, one with constant stuttering, long awkward pauses, noticeable sweat stains on my newly purchased dress shirt, and jittery hands from the nervousness that electrocuted every corner of my body. I finished speaking, not a hand was raised, not a clap was heard, there was just silence. I stood there emotionless, awaiting the feedback from my teacher. She approached me, fixating her gaze into my now teary eyes. (sigh) “George, I don’t think communication skills are your strong suit, in I personally don’t believe you will ever be an effective presenter – at least you tried and the effort is what ” she said. Her words cascaded down on me like concrete bricks. I was devastated, took a seat, and never spoke a word again that day. I once read a quote from the motivational speaker and author, Les Brown, that “don’t ever let other people’s opinion of you become your reality.” Those enabling words were very important for me as I began realizing that one experience/situation, no matter how big of a failure it seems, was still an opportunity to learn and grow from. You see, failing is just the consequence of trying and it not going your way. If you don’t try, if you don’t experience it, you’ll never be able to realize the opposite end of that stick, when it does go your way and you succeed. If you ever observe an effective communicator, you’ll realize that they unleash a power when presenting, one that draws captivates you, and engulfs you, almost like a hypnotic illusion. This is not primarily due to the content they’re speaking about, but the way they’re delivering the content i.e. tone, mannerisms, gestures, movement, etc. Anyone who has seen me speak knows that I like to use a little bit of stand-up comedy in my talks. Doing this allows me to connect with my audience, create a one-to-one direct feel, and the ability to lower the level of seriousness/formality in the room so my delivery can resonate easily with people. That is something natural to ME, however, everyone has a different approach and that is what I mean by getting to know your voice, and applying it. Look at Morgan Freeman instance, someone who narrates pretty much every documentary out there today, has a distinct voice, almost one with omnipotence, authority, power, maturity, and grandeur. That is why when we listen to him speak, even though his tone is low, serious, gradual, and fabricated, we hinge on every word he says – it controls our every thought. Perfection doesn’t exist, let’s start with this notion and get it out of our minds. I learn something new every single time I present, something I did wrong, something I should improve on next time; this craft is an ongoing cycle of constant progression – attempting to attain perfection will only create everlasting emptiness. Now, let’s also get something else straight, when I say practice, I don’t mean in front of your bathroom mirror with 100 cue cards in your hand, that’s not realistic and won’t get you more comfortable to actually doing the real thing – presenting in front of a live audience in real time – one shot, one go, this is it. A pilot, surgeon, person can only learn so much from simulations or textbooks, because learning this way contains static variables, not the unexpected/unique/unseen variables that arise the moment when you are least but have to improvise and find a way to navigate through it. So, what do you do? You are concerned about the wrong things; it’s not about what people think of you that matters, it’s about making sure that what you deliver has importance and adds value. Don’t forget, when you are on stage, have the mic, and the lights are on, everybody in the audience is investing time from their life to hear YOU and only you. It’s a power that should never be taken for granted, that should never be misused. Ben Parker, in the movie Spider-Man, “with great power comes great responsibility.” Your responsibility is to prepare, because if you fail to prepare you to fail. One of my favorite tools I use to help me get ready for the big day is visualization. This ability we have is tremendous and extremely effective if used properly. I visualize best when I walk, put on my headphones and play soothing instrumentals in the background. Doing this, allows me to play the entire presentation in my thoughts, how I’m going to speak, where I’m going to stand, how much I’m going to move, what I’ll be wearing, observing the reaction of the audience, sitting in the audience’s seat and watching myself present, and it goes on and on and on – I see every single detail before it manifests into reality. Of course, I also rehearse the content over and over again till I fully understand everything I’m presenting which is why you’ll also never see me with cue cards, notes, or anything other than a freshly pressed suit and a colorful handkerchief. It’s my belief that the moment you’re given this power, your job is to speak to people, look at them, face them, connect with them…not your paper – doing otherwise, shows that you haven’t prepared well enough and you don’t value your audience’s presence. 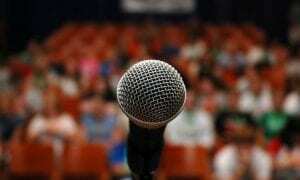 Sadly, public speaking is always a top fear for people, up there on the list with flying and heights. The fear, false expectation appearing real, is only a creation of things you expect to happen, but haven’t yet occurred – it’s for this reason I say, look for value NOT validation,because when you seek to align every person’s thought of you with qualities that make you comfortable/happy, you will never be satisfied. The reality is, you will never be able to please everyone, no matter how great or gifted you are, even Lebron James has his haters (albeit being the highest paid basketball player who recently donated $41 million for scholarships to underprivileged kids). To reassure myself when I do feel this nervousness, I say worry only about the things you can control – it is in my control to deliver a strong performance and add value to those listening, that is on me. Remember, Lebron isn’t the highest paid basketball player for his looks and charms, but for his ability to deliver, execute, and perform at an impeccable level when it matters most i.e. scoring the shot, with 4 seconds on the clock, in the other team’s home court.